An updated image of the Pillars of Creation taken by the Hubble Space Telescope with a newer camera in order to celebrate Hubble's 25th anniversary in 2015.Image: NASA, ESA, and The Hubble Heritage Team (STScI / AURA) But if you were to peer at the Pillars of Creation, part of the Eagle Nebula, through your own telescope, you wouldn't see the same thing. The images you typically see of outer space are colorized and processed in order to bring out the detail and highlight the most relevant parts for scientific study. The popularity of the Pillars of Creation may have forever changed how astronomers present images of space to the public. "Because of the public desire to see pictures like this, an awful lot of people started rendering their press releases using these kinds of images," Paul Scowen, Arizona State University astronomer and one of the image's creators, told Gizmodo. "It had an impact on the way the data of Hubble was seen and digested by the public as a general result." 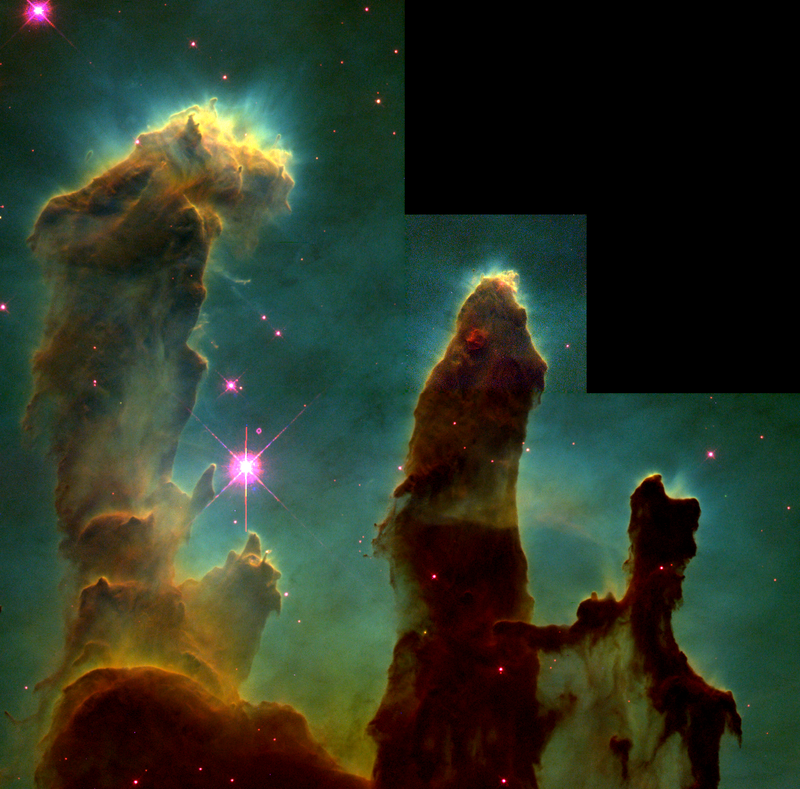 The original Pillars of Creation image used to study star formation in the Eagle Nebula. Notice the "stealth bomber" effect on the top right, due to one of the four cameras designed to take more zoomed-in images. That image has been shrunk down to match the zoom of the other three panels, leaving the black shape. The larger Eagle Nebula (also called M16) that contains the Pillars consists of thousands of stars and the dust clouds that created them. 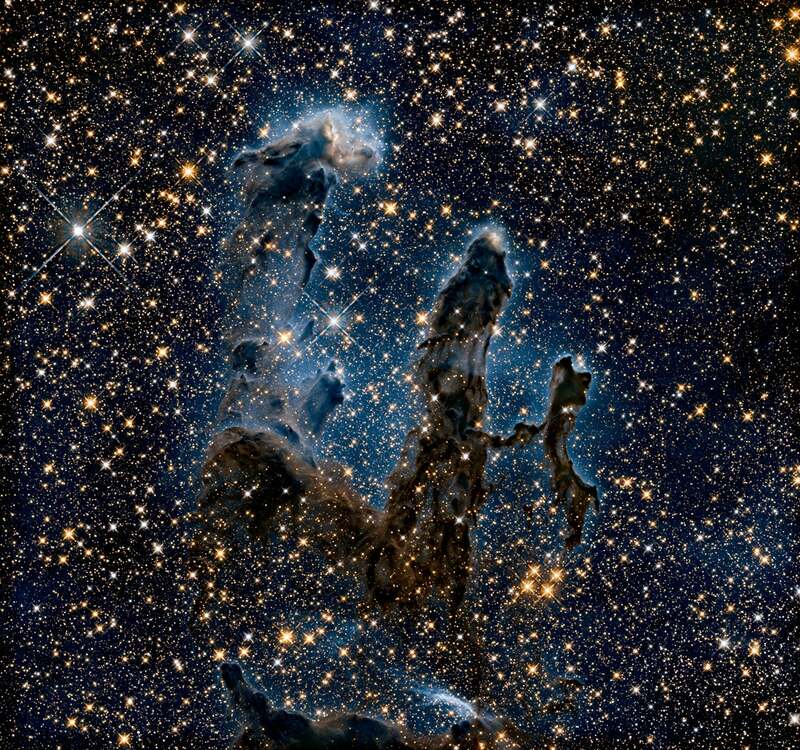 The Pillars contains dark globs of gas that could one day collapse and begin emitting radiation themselves — new stars. The Pillars make up only a small part of the 70-by-55 light-year structure; the largest pillar is around four light-years high. A team of astronomers imaged the nebula to create the Pillars of Creation image back in 1995 using the Hubble Space Telescope. Hubble orbits Earth and collects light with a large, curved mirror, then reflects it onto a smaller secondary mirror, sending the light back through a hole in the curved mirror into the instruments. There are several instruments capable of analysing all of that light in different ways. The instrument that captured the Pillars, the WFPC2, actually consists of four cameras whose images astronomers must combine. Each camera takes a quarter of the full picture, but the Planetary Camera (PC) takes a magnified view which needs to be scaled down, said Scowen. That's why the top right square is so much smaller, creating what he affectionately calls the "stealth bomber effect." Aligning all the data was perhaps the most challenging part, he said. This image isn't as magnified as you might think — the Pillars would be more than a tenth the size of the full moon in the night sky if they were bright enough to be seen with the naked eye. Instead, what's great about Hubble is the quantity of light particles it can collect from distant, faint things. It builds images from each bit like you might build a comic strip out of lots of tiny dots. The three plates used to make the famous composite image of the Pillars of Creation. The leftmost image depicts light emitted by oxygen, which the astronomers depicted in blue. The center depicts light emitted by hydrogen, which the astronomers depicted in green. The rightmost shows the light emitted by sulphur, which the astronomers depicted in red. Image: Paul Scowen (Arizona State University) But unlike a comic strip, you can't look at every colour, or wavelength, of the Hubble light at the same time. The researchers block out much of the light using a filter, and only look at plates covering certain scientifically interesting light wavelengths at a time. 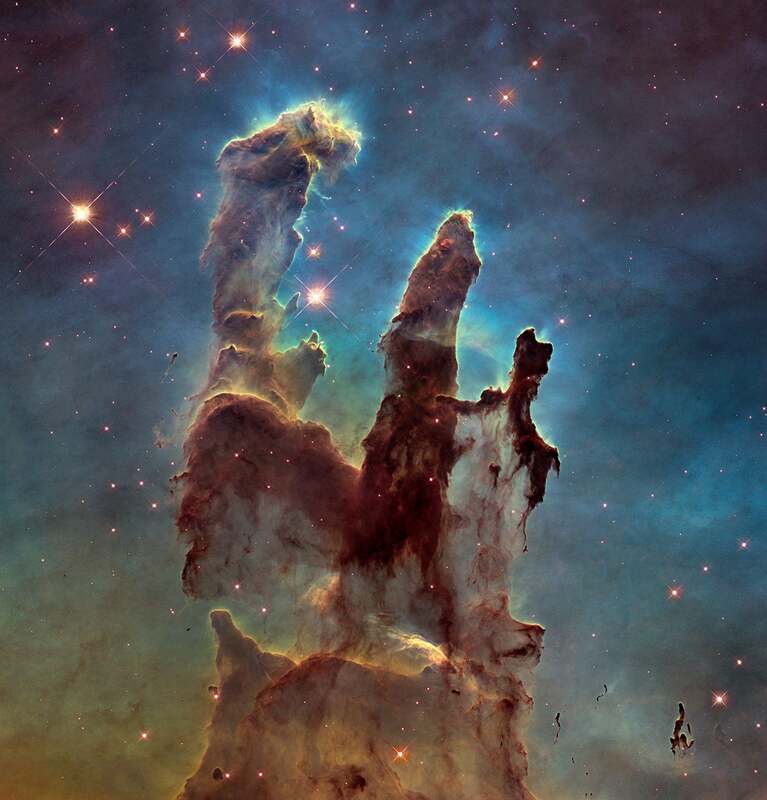 In the case of the famous Pillars of Creation image, they were interested in the light emitted by certain excited oxygen, hydrogen, and sulphur atoms. Normally, this would result in black-and-white images, depicting only the light that arrived at 502 nanometres for the oxygen, 657 nanometres for the hydrogen, and 673 nanometres for the sulphur. This translates to green light and two indistinguishable shades of red — probably not the best three colours for an image to present to the public. Instead, the researchers combined the three images, depicting the oxygen emission in blue, the hydrogen in green, and the sulphur in red. Some might feel duped, but "you'd never get an image like this with a backyard telescope because of the Earth's atmosphere," Kate Whitaker, astronomer from the University of Connecticut told Gizmodo, though the Pillars are visible on a dark night with very large telescopes. "You wouldn't see the details you see with the Hubble images," she said. And the researchers never claimed this is what Pillars really look like, said Scowen. Instead it's data that Hubble really saw, presented in a more scientifically meaningful way. Scientists have continued observing the Eagle Nebula, and they re-imaged it with updated instrumentation for the Hubble Space Telescope's 25th anniversary. They have even tried to view it in three dimensions. The dust is nearly opaque when observed with visible light, but viewing only the infrared light has allowed scientists to peer inside the pillars themselves. This also reveals the large number of stars formed by the nebula. Others have imaged the x-rays coming from the pillars using NASA's Chandra X-ray Observatory, showing the light of new stars forming at the tip of the biggest pillar. A 2015 Hubble view of the Pillars of Creation showing only the infrared light, demonstrating stars forming inside and around the gas columns. This image only uses two colours of light — 1100 nm infrared light is depicted in blue, while 1600nnm light is depicted in yellow.Image: NASA, ESA/Hubble and the Hubble Heritage Team Some worried that new observations implied that the Pillars were no more — other images taken in the infrared seem to show a supernova's explosion approaching them. Perhaps humans saw this supernova in the sky a millennium ago, but if the Pillars have been wiped out, the light showing their destruction hasn't reached Earth yet. More recent data seems to have refuted the idea that a supernova has already destroyed pillars. Regardless, the image will remain a permanent fixture in astronomy lore. Said Scowen: "It continues to be held up as one of the most popular Hubble pictures ever taken."